For any occasion, the Palm Beach St. John Knits boutique is at your service to help you find the St. John wardrobe you’re looking for. Whether you’re dressing for a glamorous evening or updating your weekend getaway looks, the Palm Beach boutique stylists can provide you with the personal and luxury shopping experience you would expect from St. John. Inquire with one of our wardrobe specialists about the many services we offer including alterations, in-home delivery and one-on-one fit and style consultation. For more information please call us at 561-833-5564. Located just a few blocks from the Atlantic Ocean, the recently remodeled store features a modern interior space while keeping its classic Mediterranean style building on the exterior. Clients continue returning to the Palm Beach St. John boutique for all their wardrobing needs, whether they’re residents or vacationing. 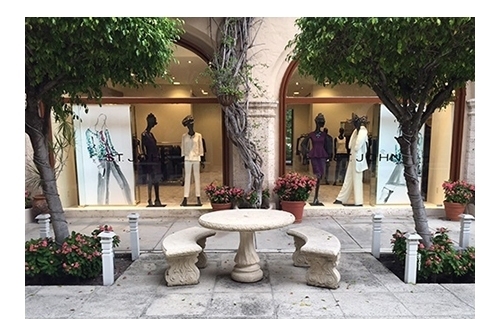 A standout along one of the oldest shopping streets in America at 256 Worth Avenue, it’s the leading destination for women’s ready-to-wear in Palm Beach. The one on one service and impeccable attention to detail from our personal stylists is matched only by the level of luxury and craftsmanship the brand is known for. We practice craft and couture. With iconic American design and signature knits, we invite you to experience first-hand, the meticulous details, luxury craftsmanship, and one of a kind embellishments that have become synonymous with St. John Knits. Visit us at the St. John Knits Palm Beach boutique and we will personally guide you through the range of St. John collections to see the effortless, alluring and refined clothing that has appealed to women all over the world since 1962.